We are pleased to announce that we have just released a new version of GenMyModel. This version brings many improvement to both the GenMyModel Dashboard and the Editor. We have changed a few things on the dashboard to improve user experience. Your most recent projects, with a button to open them directly in the editor. Recent activity, to see at a glance who recently worked on your projects. In the previous version project creation was accessible through several buttons depending on your intent (importing a model, creating a blank one, reversing…). We improved on this and streamlined the creation process. Just select “Create a Project”, select the type of the model and all the project creation options will be displayed for this particular model type. The projects list now shows projects from all model types by default. A quick filter is available to filter the list by type in case you want to focus on a certain type. We also improve the design to the show project description within the list and added a quick access link to access the project public page (for public projects). GenMyModel is also a community of passionate modelers, all the public models are available to browse and improve upon on our public repository. The repository used to be quite separated from the dashboard, preventing users from easily discovering interesting models. To make things more convenient you can now explore, search and clone all the public models directly from the dashboard in the “Explore” tab. What’s New in the Editor? We have added a few features to the editor. It’s now possible to Copy/Paste elements between different projects of the same type (with the exception of BPMN). Copy/Paste between projects works just as you would expect, select some elements on your diagrams, press ctrl+C (or cmd+C if you are on a Mac), open any of your other projects, press ctrl+V (or cmd+V), and all the elements will be pasted over. The clipboard is now also resilient, it is saved in your browser local storage and will remain if you close your browser and reopen it later. When collaborating on models documentation is of the utmost importance. The documentation field used to be hidden at the bottom of object properties, which was not ideal. We removed it from there, and created a tab just for it next to the object properties. You can now easily document elements without having to scroll endlessly. 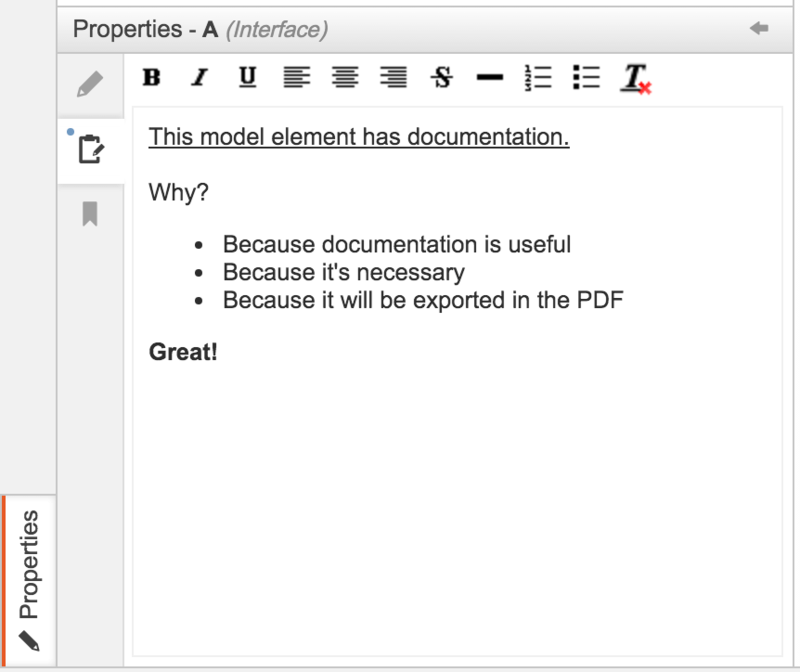 Documentation of model elements is also inserted when you export your model to PDF. With GenMyModel you are not just doing drawings but real models that you can use to generate code or anything you wish. Until now the editor was lacking a consistent way to add custom properties to model elements, you could use the documentation field, but that really wasn’t ideal. 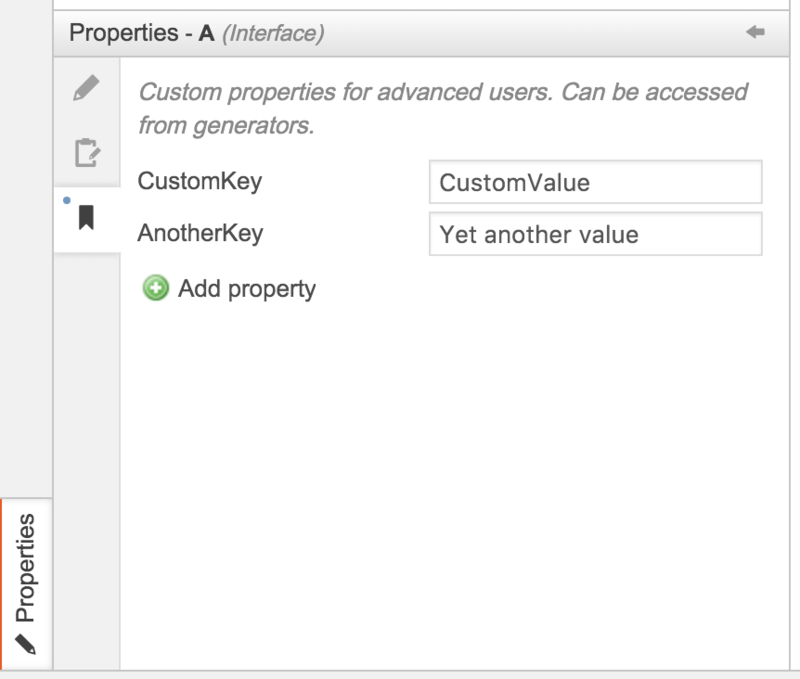 We are pleased to announce that we have added the ability to add custom properties to any model elements. All the custom properties are accessible from your custom generators. A lot of the work was also done under the hood to improve performance and reliability. In some cases, the position of labels on segments could shift by a few pixels between the client and the server, this was caused by the size of elements that could be different on both side due to the diversity of browser configuration. We reviewed the whole system to make it more reliable, and now positioning is perfect, every time. We strive to provide our users with the most enjoyable and smoothest experience we can. Resizing lanes on BPMN could sometime feel a little slow, we have worked on that and it’s now just as smooth to resize as the rest of the elements. There are time when your connection to the Internet can get spotty and if you are disconnected too long desynchronization can occur. In that case the editor used to loose your context like the list of opened diagrams and your scroll position. Now, when such event occurs, the editor recovers gracefully and the resynchronization is almost transparent. We are proud to bring you this new release and hope that you will enjoy all the new features and improvements. Feel free to comment to tell us what you think about these new features!